Use the expandable navigational menu on the left hand column to find a specific issue of Canola Watch by year, month and date. 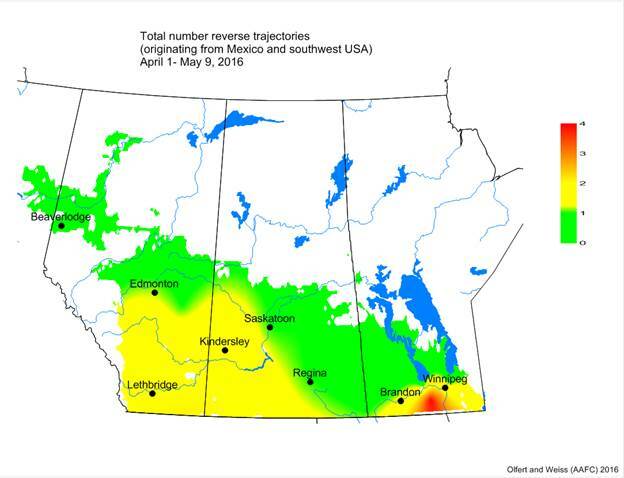 Alert: What to do with high moisture canola? Snow on canola. What to do? 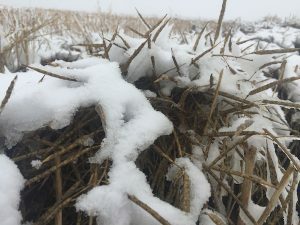 Snow on swathed canola will delay harvest, just like a rain would, but all a grower can do in this situation is wait it out. Snow on standing canola could be another matter. Snow in October is not usually a major problem for fall soil tests. Temperatures often improve before winter sets in for good, so sampling opportunities usually present themselves. Canola is considered “tough” at moisture levels between 10% and 12.5%. “Damp” is anything above that. With tough canola, aeration can be enough to dry it to safe storage levels as long as air has capacity to dry: warm with low relatively humidity (RH). At RH values above 70%, the equilibrium moisture content will be above 8% to 9%, meaning sufficient drying for safe long term storage is difficult to achieve. Drying canola with aeration alone also requires sufficient air flow and time to move the drying front to the top of the grain mass. Damp canola will require heated air drying and rigorous management to condition it for safe storage. When freezing temperatures stop fall weed control plans, snow is likely more of a help than a hindrance with respect to overall weed condition. The snow layer is likely to insulate the weed leaf material from the colder conditions that follow it. That could mean you’re back spraying earlier than you would be with frost alone. Spray decisions — when to spray or whether to spray at all — will depend on leaf condition after the snow is gone. If you are thinking about what to plant for next year, a great place to look for unbiased variety data that reflect actual production practices is the Canola Performance Trials website at www.canolaperformancetrials.ca. Get the agronomy, marketing and management information you need to boost your bottom line at one of Alberta Canola’s 12 Powering Your Profits events across Alberta. The tour starts November 15 in Strathmore and Camrose.